This past weekend several of the Phi Delta Theta brothers went to Ohio for the Phi Delta Theta Kleberg Emerging Leaders Institute where they received the prestigious Founders Trophy from Phi Delta Theta! Phi Delta Theta awards the Founders Trophy to one chapter at a mid-sized institution each year. 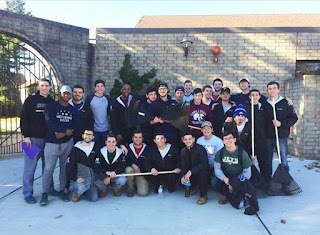 The New York Kappa Chapter was chosen because of their dedication to their institution, the surrounding community, and their national organization. Phi Delta Theta was founded in 1848 at Miami University in Ohio, when six men built an organization that stood for Friendship, Sound Learning, and Rectitude. These are the same principles and values that we see from the men of the New York Kappa Chapter of Phi Delta Theta at Hofstra University. The men of Phi Delta Theta continuously exceed the expectations that Hofstra has for the members of Fraternity and Sorority Life, winning Chapter of the Year at the Hofstra Student Leadership Awards for the last three consecutive years. This acknowledgement is from their continuous efforts in helping better the Hofstra Community both on and off campus. “Just being able to make an impact any way we can is great. 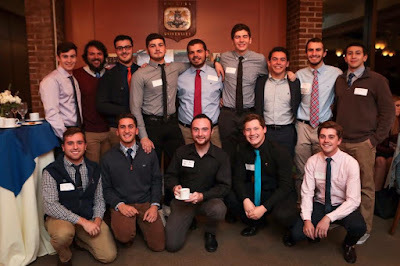 Being active around campus and in the community makes our brotherhood stronger,” says Gio Annatelli, current President of the New York Kappa Chapter. , to name a few: Just Sing: The Annual Pete Teleha Memorial Concert co- hosted with the Honors College in honor of one of their brothers that passed away, Pie-a-Phi where students can pie any brother in the face in efforts to raise money for ALS and Phi-Hop where students are able to pre-order pancakes to be delivered by the men of Phi Delta Theta. “Phi Delta Theta has consistently pushed themselves to be a better organization, better men, and a better example of what fraternity is. I am so excited to see their hard work, creativity, and dedication recognized both at Hofstra and at the national level.” Sara Diem, Assistant Director of Student Leadership and Engagement. Student Affairs at Hofstra University encourages all students to succeed in whatever they put their minds to and we are proud to have students on our campus that value fraternity and Hofstra’s commitment to better our community. Congratulations to the students on your award, we are excited to see what your organization has instore for our campus this year.